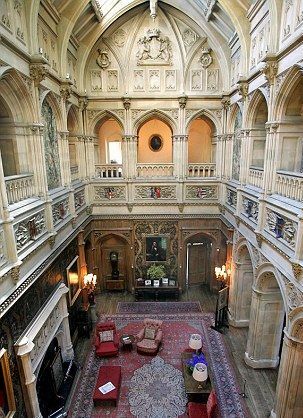 Highclere Castle is the beautiful country house of the Earl of Carnarvon and is located in Hampshire, England. The 5,000 acre estate features the house and the gardens which are generally open to the public during the months of July and August. 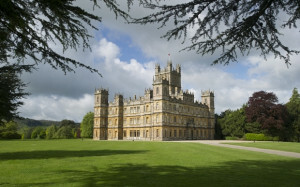 For more details about times, prices and additional tourist information about Highclere Castle, please click on the link www.highclerecastle.co.uk. In this post, I will discuss the history of Highclere Castle and the Carnarvon family that include Lady Almina who is responsible for turning Highclere into a military hospital during World War I, the 5th Earl of Carnarvon that funded archaeologist Howard Carter and the discovery of the tomb of Tutukanhamun in 1922 through to the current Lord and Lady of Carnarvon that continue to run the estate in modern times. 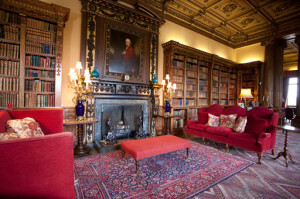 I will also give a brief tour of the interior rooms of Highclere as well as the exterior areas of the large estate including the gardens and outbuildings on the property. 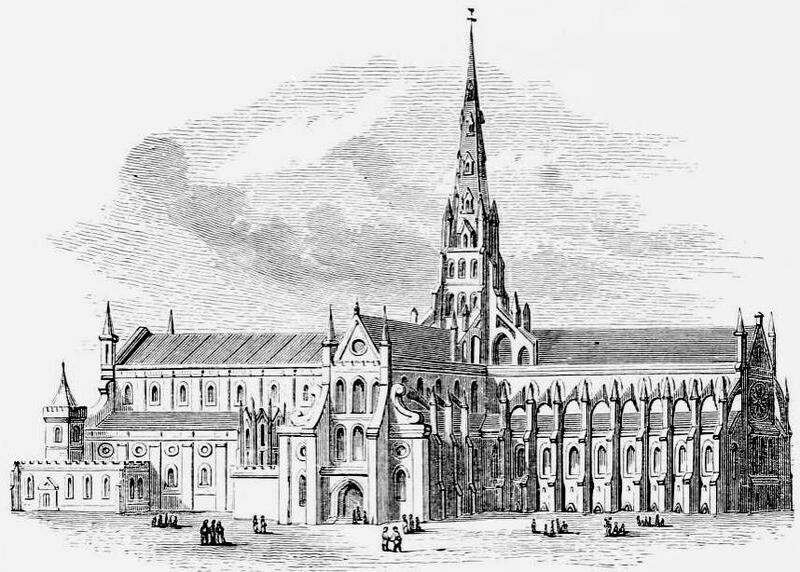 During the twelfth and thirteenth century the Bishops of Winchester built a medieval palace near the site of the current Highclere Castle. Several centuries later a red brick Tudor-style house was built. 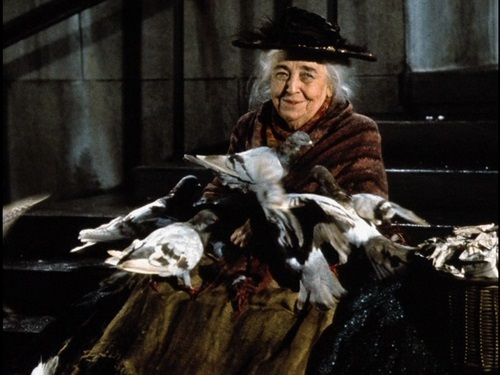 Then, in 1692 Highclere was bequeathed to the only daughter of Samuel Pepys, Margaret. She was the first wife of the 8th Earl of Pembroke and later the estate would be inherited by her second son, Robert Sawyer Herbert, who throughout the years added a lovely art collection which was displayed in the home and built the stone temples in the garden of Highclere. 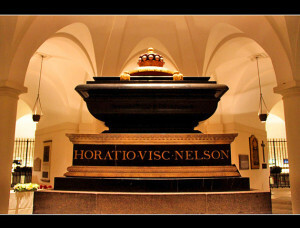 With his death in 1769, his nephew and heir Henry Herbert (1741-1811) would inherit the estate and later become Lord and then Baron Porchester. 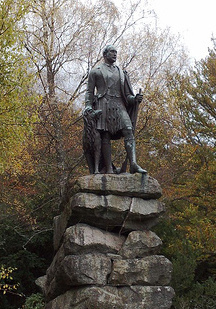 In 1793, King George III would honor him with the title of the 1st Earl of Carnarvon. Henry married Lady Elizabeth Wyndham on July 15, 1771 and they had five sons and one daughter. Their oldest son, Henry George Herbert (1772-1833) would later inherit the estate from his father and become the 2nd Earl of Carnarvon. 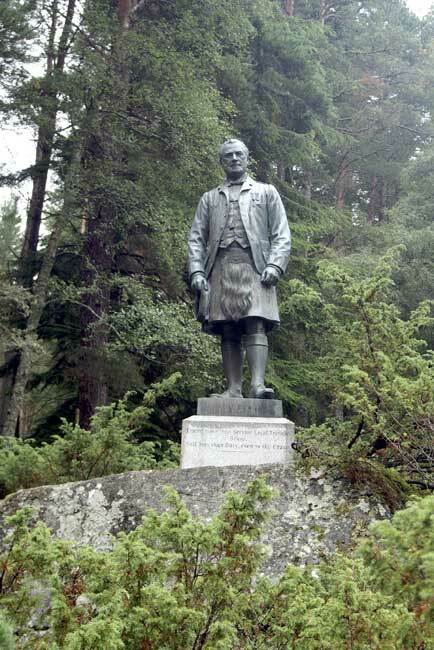 He was educated at Eton and later became a British peer and a Whig politician. He married Elizabeth Acland on April 26, 1796 and they had three daughters and two sons. 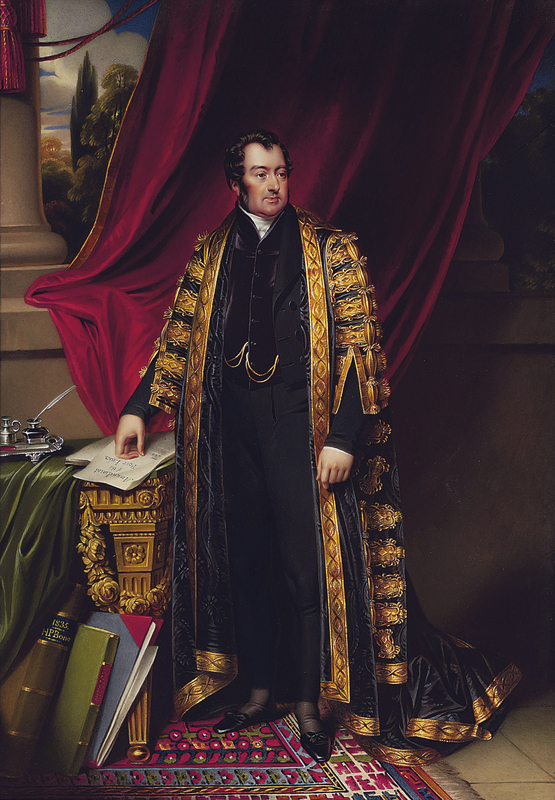 Upon Henry’s death in 1833 his oldest son, Henry George Herbert (1800-1849), inherited the titles and properties of the estate. 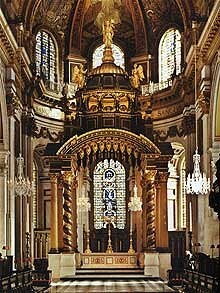 The 3rd Earl of Carnarvon was educated at Eton like his father and also Christ Church in Oxford. 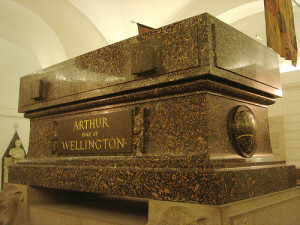 He later became a British peer, a Whig politician and also a very good cricket player! In 1839 the 3rd Earl commissioned Sir Charles Barry (he had just finished the construction of the House of Parliament in London) to redesign a large Jacobethan-style house of Bath stone combined with several towers built in an Italianate-style, it was completed in 1842. In 1830, Lord Carnarvon married Henrietta Howard-Molyneux and they had three sons and one daughter. 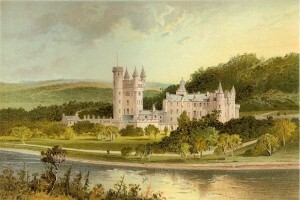 When he died in 1849 his son, Henry Howard Herbert (1831-1890) would become the 4th Earl of Carnarvon. The 4th Earl of Carnarvon was a prominent Conservative politician and under the reign of Queen Victoria he served twice as the Secretary of State for the Colonies and later as the Lord Lieutenant of Ireland. 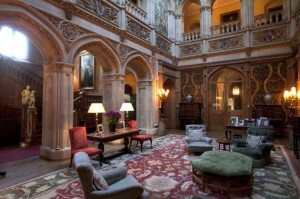 The 4th Earl commissioned architect Thomas Allom to continue the work started by the 3rd Earl and Sir Barry and he would finish the interior design and provide the lavish furnishings of Highclere. 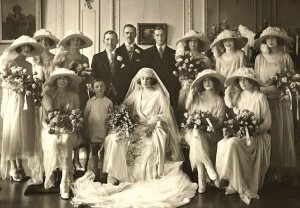 Meanwhile, the 4th Earl had married Lady Evelyn Stanhope in 1861 and they had one son and three daughters. After the death of his first wife in 1875, Lord Carnarvon married his first cousin, Elizabeth, in 1878 and had two more sons. 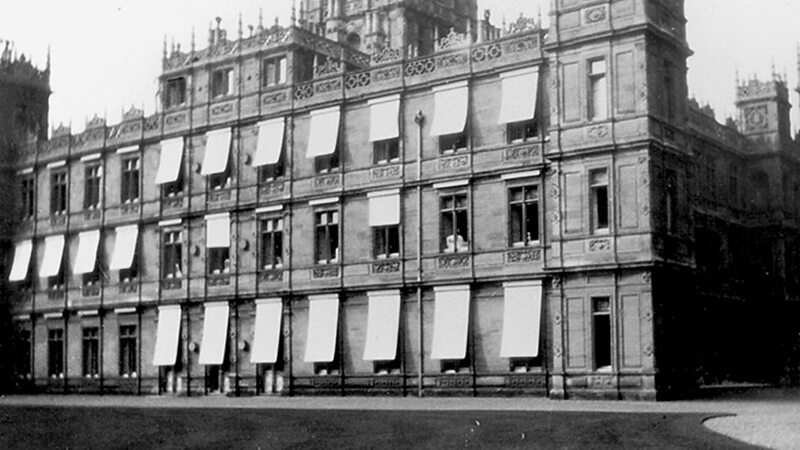 It was during this time that the lavish interior decorations and furnishings of Highclere were completed. 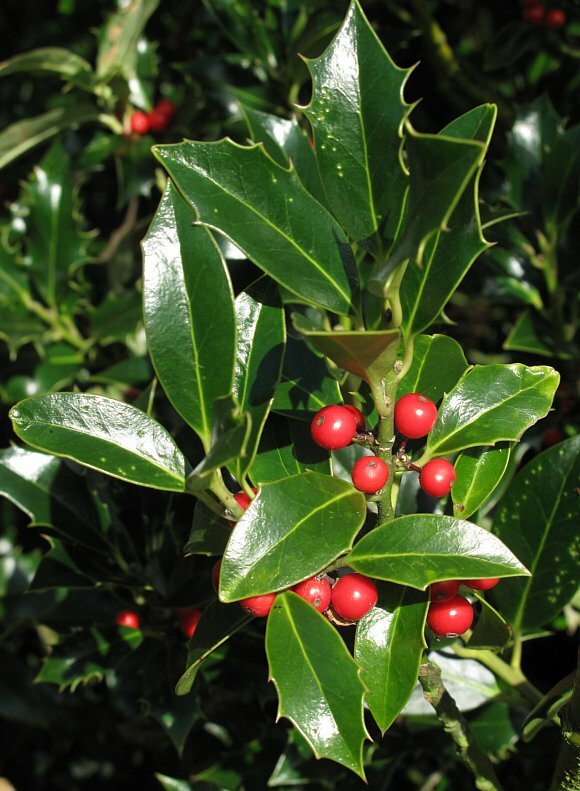 After Henry died in 1890, his eldest son George Edward Herbert (1866-1923) inherited the titles and the property. The 5th Earl of Carnarvon married his first wife, Almina Wombwell, she was the illegitimate daughter of the millionaire banker Alfred de Rothschild in June 1895 and her money helped to fund improvements to Highclere. 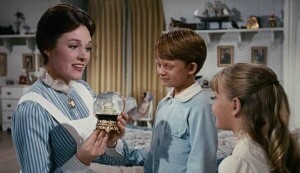 The couple had two children, a son named Henry and a daughter named Evelyn. 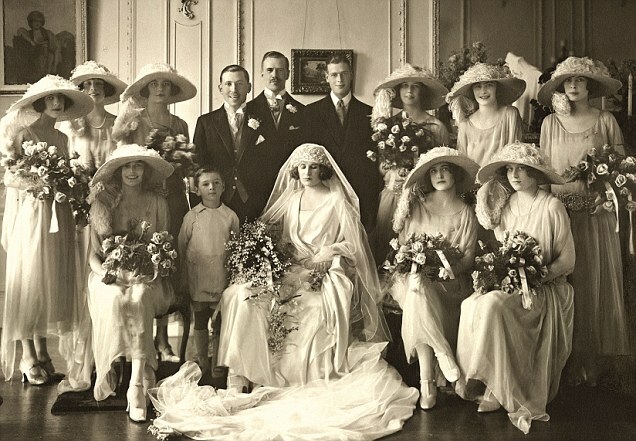 Immensely wealth, the couple lived an extravagant lifestyle and with the start of the opulent Edwardian period the house was always full with parties for Tory politicians. The couple also indulged in the expensive pursuit of horse racing and in 1902 Carnarvon became the owner of the Highclere Stud, a business that breed thoroughbred race horses. But the couple was also aware of their civic responsibilities and during World War I Almina converted Highclere into a hospital for sick and injured soldiers returning home from the battlefields of Europe starting in September 1914 (shown below is a photo of the south facing windows of Highclere with blinds to shield the patients from the mid-day sun). Almina had become an excellent nurse taking care of the wounded soldiers and there are many documented letters from patients and their families that express gratitude and appreciation for her kindness and care in opening her home to them while the soldiers recovered. 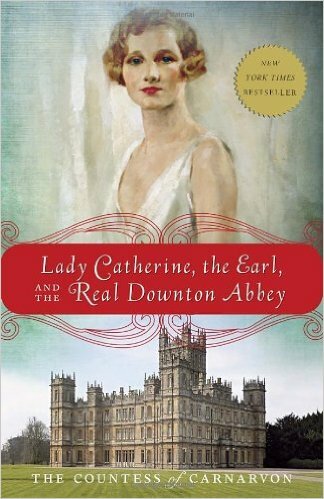 Later, after the war concluded, Highclere returned to the private home of the Carnarvon family. 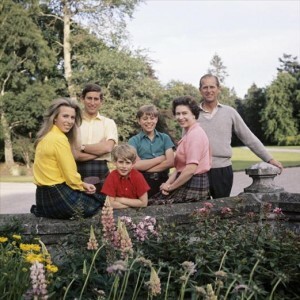 The 7th Earl of Carnarvon, Henry George Herbert (1924-2001), also married an American named Jean Wallop in January 1956 and they had three children, two sons and a daughter. 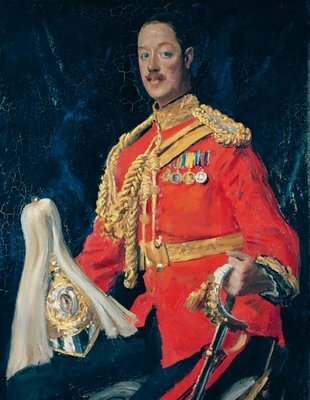 Henry served as a Lieutenant in the Royal Horse Guards and later became an Honorary Colonel. In 1969, Henry became the Racing Manager to Queen Elizabeth II and throughout the years they have developed a close friendship with the Queen calling him “Porchy” and she visited Highclere often at the invitation of the 7th Earl. 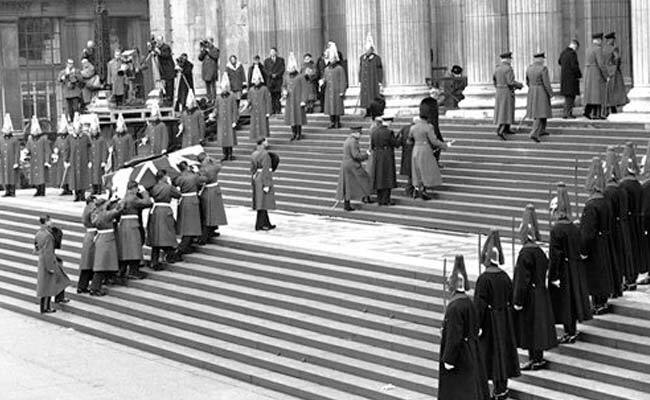 In 1982, the Queen invested Henry as a Knight Commander of the Royal Victorian Order, an honor which is given to those that are in personal service to the sovereign. 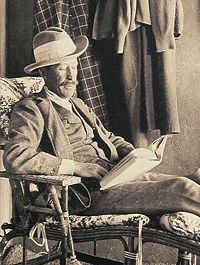 When the 7th Earl died in 2001 his oldest son, George Reginald Herbert (1956-current) became the 8th Earl of Carnarvon. 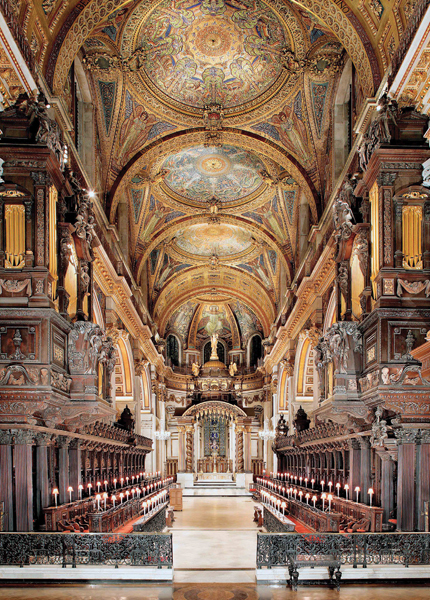 He is the godson of Queen Elizabeth II, studied at Eton and graduated from St. John’s College in Oxford. 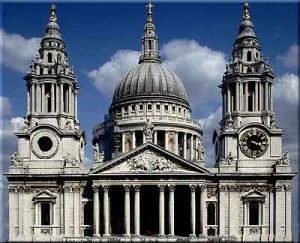 George married Jayne Wilby in December 1989 and they had two children, a daughter and then a son. George divorced Jayne in 1998. 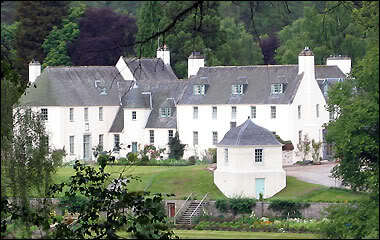 The 7th Earl remarried in February 1999 to Fionaa Aitken and they have one son. The couple is very active in the daily running of the estate and family live in a small section of Highclere while the rest of the house is opened for tours and as a venue for special occasions, such as weddings. Sadly by 2009, the upkeep of Highclere had become very costly and water damage throughout the years had caused the stonework to crumble and in other areas the ceilings had collapsed. Over 50 rooms of the house were in need of extensive repairs with some of the rooms on the main floors of Highclere remaining occupied and in daily use. With luck, the ITV/PBS television series “Downton Abbey” had begun filming and paid to use Highclere for exterior and some interior scenes and with the popularity of the show it also created an increased interest in tours providing much needed funding for the repair work. During the renovation, the 8th Earl and his family moved into a small cottage nearby but as the work was completed they moved back into Highclere occupying the house during the winter months but moving back to the cottage during the summer months when tours were ongoing. The current Countess of Carnarvon is the author of the two books mentioned above and shown below about her predecessors. Highclere Castle is open to the public for a limited time during the year, generally during the months of July and August. Tours of the house are available; the venue is also opened for special events such as weddings. 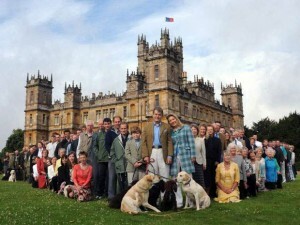 Visitors will find that many of Highclere’s interior rooms look familiar from the Downton Abbey television series. 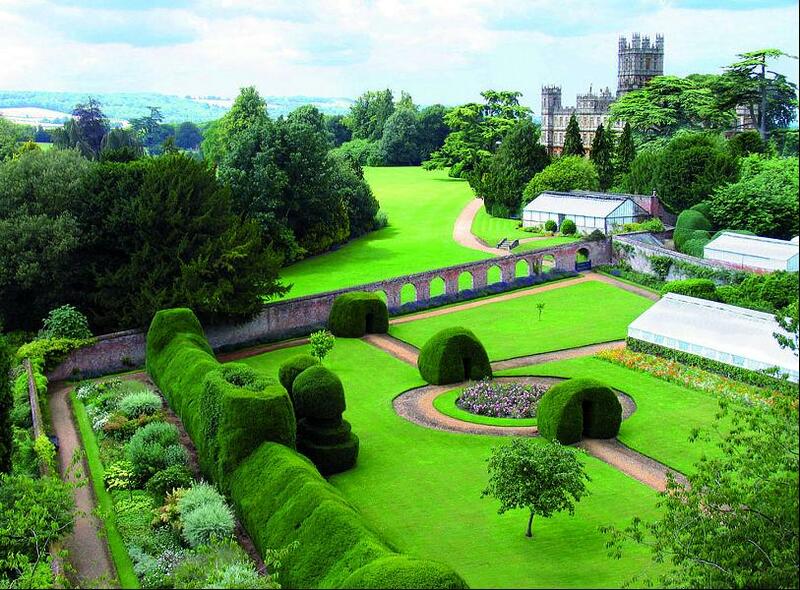 The beautiful gardens were designed by the famous landscape architecture Capability Brown. For more details about times, prices and additional tourist information about Highclere Castle, please click on the link www.highclerecastle.co.uk. The Entrance Hall of Highclere Castle instantly sets a grand, elegant and lavish style of interior decorations. 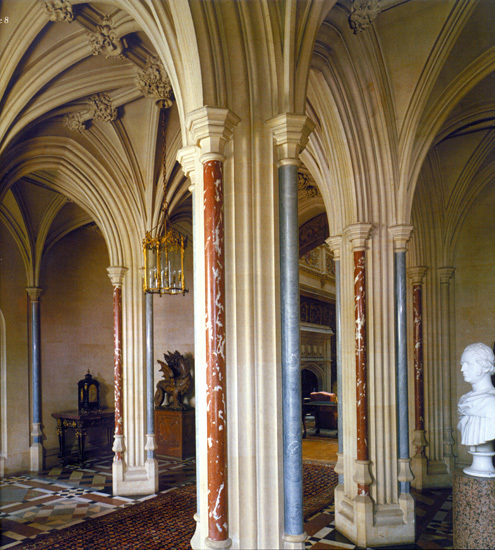 This area of the house is credited to the Gothic-style design of George Gilbert Scott in 1870 (the same person responsible for the design of the Prince Albert Memorial in London) features graceful columns and a vaulted ceiling. 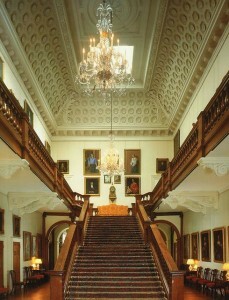 The Main Staircase was finished in 1862 and in the past would have only been used by the Carnarvon Family and their guests, the servants would have used a different stairway to the upper floors. 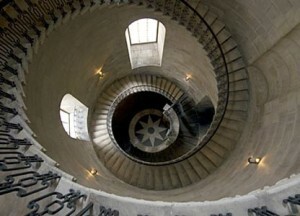 The oak carved staircase was designed by Thomas Allom and built by Cox and Son of London. The Saloon of Highclere was commissioned by the 4th Earl and designed by the architect Thomas Allom. It decorated in a distinct Gothic-style featuring leather wallcoverings dated from 1631 and imported from Cordoba, Spain and originally purchased by the 3rd Earl and hung in the house in 1862. A vaulted ceiling soars 50 feet high and provides excellent acoustics for when singers and musicians would be brought in and positioned on the second- floor gallery that surrounds the Saloon to entertain guests on the main floor. The Dining Room is used frequently by the Carnarvon family for daily meals and also on occasion for larger dinner parties. The main feature in this room is the massive 1635 equestrian portrait of King Charles I by Anthony van Dyck which is hung over a sideboard seemingly dominating the room’s décor, it is one of several copies and the original portrait is part of the Royal Collection Displayed in the room are several other important pieces of artwork such as the portrait of Henry Herbert, the First Earl of Carnarvon, by Gainsborough and a portrait of Anne Sophia, the Countess of Carnarvon, by van Dyck. 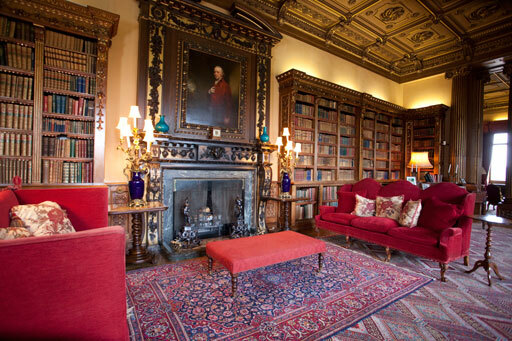 The Library of Highclere was first used by the 4th Earl of Carnarvon as a type of private office for meetings with his Tory political friends; the 4th Earl was a member of Prime Minister Disraeli Cabinet during the reign of Queen Victoria. The room is decorated in a very definite masculine style and there are over 5,600 books with come dating back to the 16th century. Another portrait of Henry Herbert, the First Earl of Carnarvon, this time done by Beechey is displayed over the fireplace. Later, the room was used by the Carnarvon family for drinks and conversation before and after meals. The Music Room features a Baroque-style ceiling by Francis Hayman in the 1730s and the walls are hung with 16th Century Italian embroideries. The main item of interest in this room is the mahogany desk and chair which is said to have belonged to Napoleon. The two pieces of furniture were taken to Longwood house on St. Helena where Napoleon would die in exile, the set was bought by the Third Earl of Carnarvon in 1821. The windows of the Music Room open to the south side of Highclere and offer a wonderful view of Heaven’s Gate located on the summit of Sidown Hill. 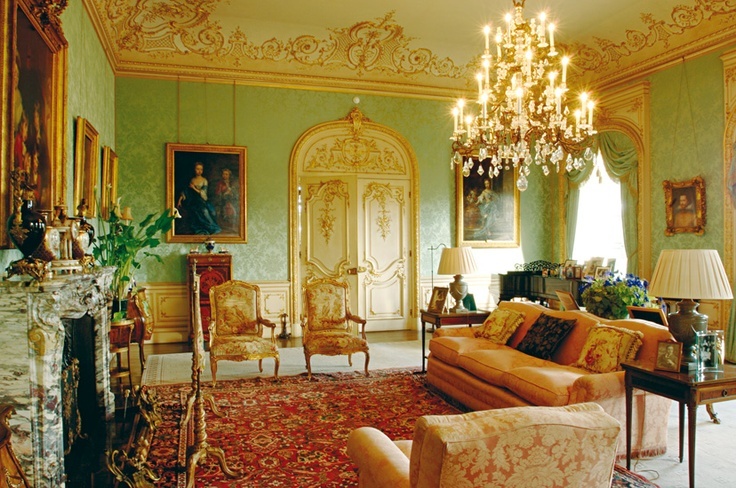 The Drawing Room was originally beautifully decorated in a Rococo-Revival style by Lady Almina, the 5th Countess of Carnarvon, with lovely green French silk curtains made from material provided by her aristocratic father, Alfred de Rothschild. 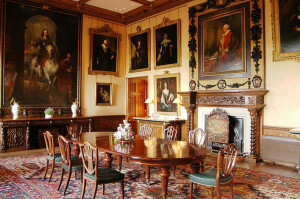 There are several portraits of the Carnarvon family displayed on the walls of the room, such as a portrait of the children of the First Earl of Carnarvon by Sir William Beechey depicting them in the window of Highclere. 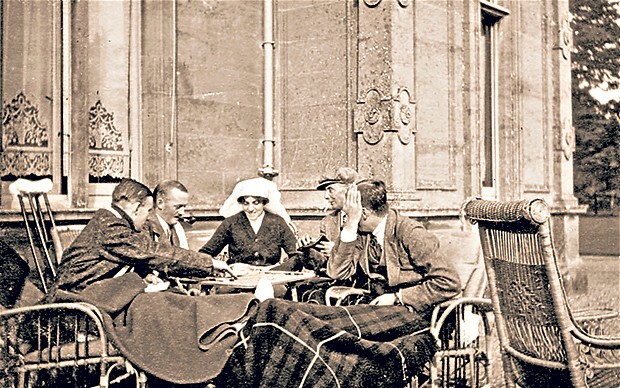 The room was used for entertaining guests but during World War I, when Highclere was converted into a military hospital under the direction of Lady Almina, the furniture of the Drawing Room was removed, stored and replaced with hospital cots filled with wounded soldiers. Found recently in a hidden narrow cupboard between the double doors from the Drawing Room to the Smoking Room was a collection of Egyptian artifacts acquired by the 5th Earl of Carnarvon. Adjacent to the Drawing Room is the Smoking Room where the Carnarvon men and their male guests would go for after dinner drinks and to smoke. During the Crimean War between the Russians and British, French & the Ottoman Empire (October 1853 to February 1, the 856) the soldiers enjoyed smoking Turkish tobacco and when they returned to England the habit continued. Since the room was used specifically by men it was decorated in a very masculine style with heavy velvet curtains that served a dual purpose of absorbing the smoke and prevent it from going into other areas of the house, men would also change into velvet “smoking jackets”. Visitors to Highclere are able to see a very limited number of bedrooms on the upper floors. Some of the rooms are now being used as offices and the current Lay Carnarvon is in the process of renovating some of the other rooms to recreate the former children’s nursery rooms. 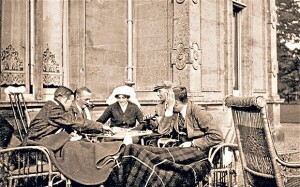 During World War I when Highclere was used as a hospital the Arundel bedroom and adjoin dressing room were converted into an operating and recovery room. 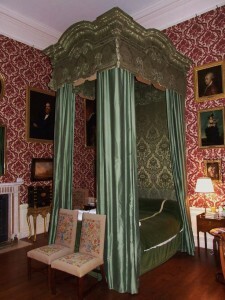 Another bedroom of note is the Mercia bedroom which is furnished with a four-poster bed covered with 18th century silks. 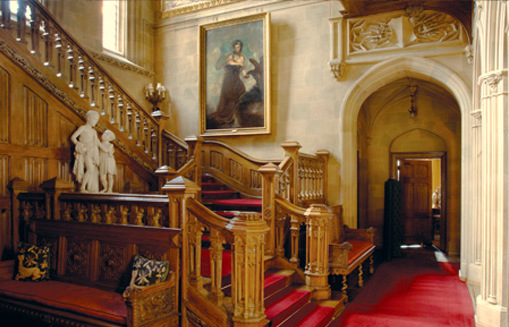 Behind the green baize door of the Saloon, there is a stone staircase that leads to the old staff dining room and sitting rooms, the kitchens, cellars and the other utility areas used by the servants of Highclere. (The green baize wool material, generally used to cover the surface of a pool table, was used effectively for soundproofing the noises coming from the servant areas) A long time ago, Highclere would have a large staff of over 50 servants that included butlers, footmen, housekeepers, maids, stewards and kitchen staff. 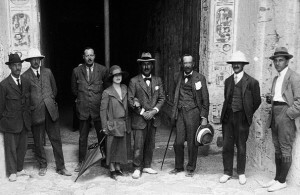 A portion of the downstairs area of Highclere has been used for a special exhibit which highlights the 5th Earl of Carnarvon interest in the ancient Egyptian culture. Starting in 1898, Carnarvon made many trips to Egypt sponsoring archaeological excavations throughout the region. 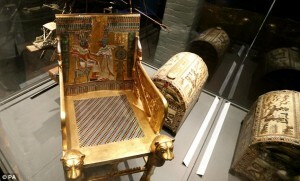 The most famous one was when he accompanied Howard Carter in the discovery of the tomb of Tutankhamun in 1922. 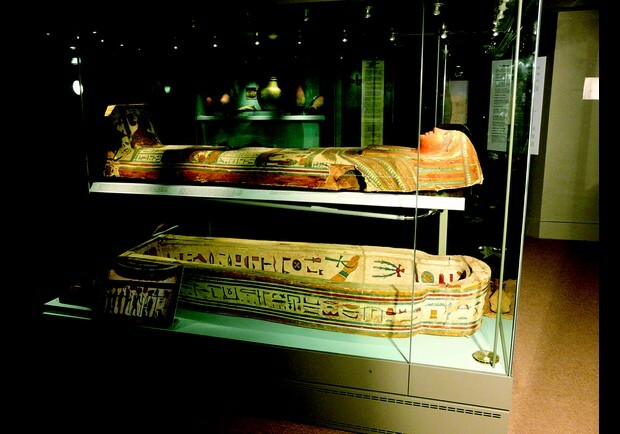 During Carnarvon’s time in Egypt he acquired a substantial collection of artifacts and after his death in 1923 his widow, Lady Almina, sold the collection to the Metropolitan Museum in New York City. Unknown at the time, the 5th Earl had a small private collection which was keep in a hidden narrow cupboard located between the set of double doors leading from the Drawing Room to the Smoking Room which was found in 1987. The re-discovered items are part of the new exhibit now located at Highclere, the British Museum and the Newbury Museum have also loaned additional items to the Carnarvon family for the special exhibition. There are several follies (costly ornamental building with no practical purpose built in a park) scattered throughout the grounds of the estate. These follies were created so that during walks around the estate one would have a quiet place to pause, reflect or perhaps contemplate the beauty of the surrounding landscape. 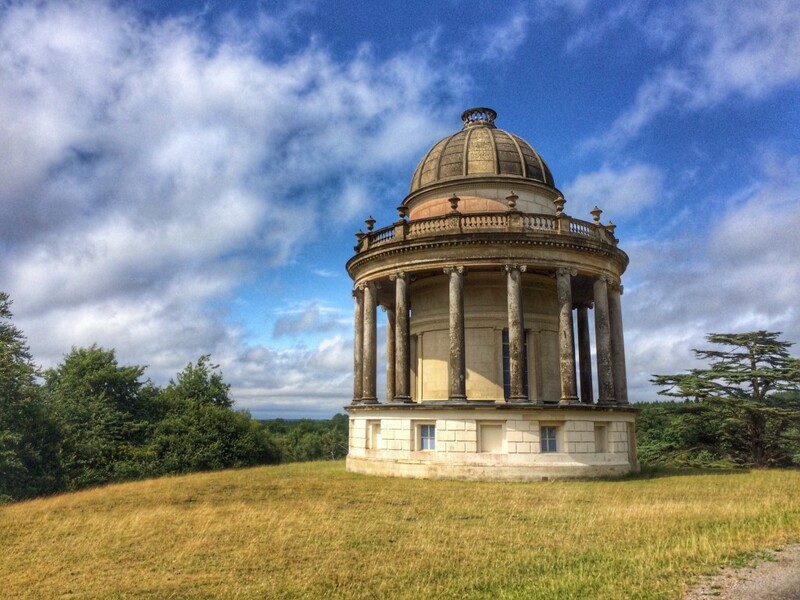 Located in an area east of the house is the Temple of Diana which was built circa 1743 in the north-west near Dunsmore Lake, the lovely structure features Corinthian columns. 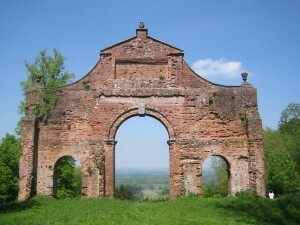 Another structure located to the south on Sidown Hill is Heaven’s Gate which was built in 1749. 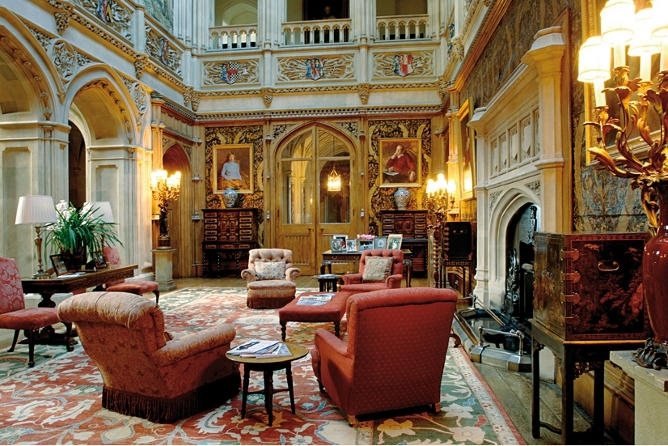 Highclere Castle is open to the public for tours of the house on a limited basis during the year, generally during the months of July and August. 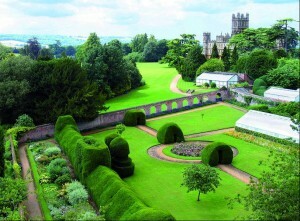 For more details about times, prices and additional tourist information about Highclere Castle, please click on the link www.highclerecastle.co.uk. 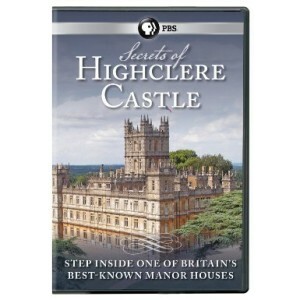 Additional Note: I would highly recommend the “Secrets of Highclere Castle” DVD, which offers a wonderful glimpse into the estate and house. Althorp has existed since medieval times as a small hamlet which was originally situated on the southwest side of the property just east of the current West Lodge. 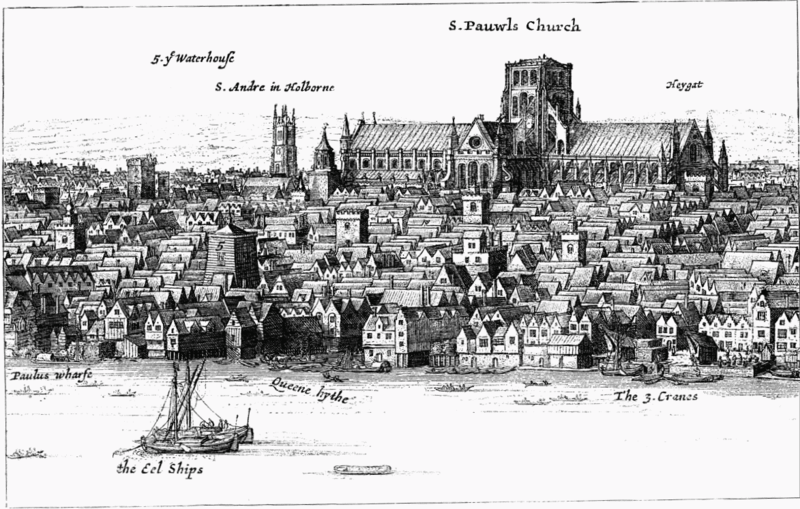 By the 15th century the small population had dwindled and eventually all the residences had moved away. In 1508, John Spencer purchased the Althorp property from the Catesby family with money earned from his sheep business. The land consisted of 300 acres of grassland and another 100 acres of woodland with 40 acres covered with water. Over the next four years, Spencer worked hard and the property was divided into four large sheep pastures. 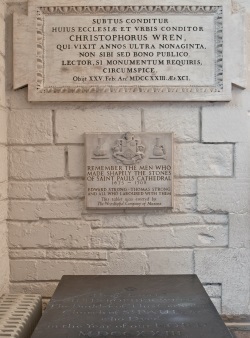 When John Spencer died in 1522, the estate passed to his youngest son, William. William was the Sheriff of Northamptonshire and he owned it until his death in 1532. Over the next several years the property remained in the Spencer family with ownership passing from father to son. By 1603, Robert Spencer had been made the 1st Baron of Wormleighton and King Charles I had planned a Royal visit to the estate. Althorp was enlarged to accommodate the King and his court, a new drawing room was built and the main hall was enlarged for a grand banquet. 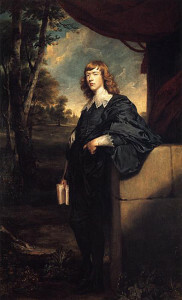 After Robert Spencer’s death in 1627, Althorp went to his son William. Several more years passed and the estate ownership went from father to son. Henry Spencer, the eldest son of William was rewarded the title of Earl of Sunderland after his honorable military service, unfortunately he was killed in battle at the age of 23. 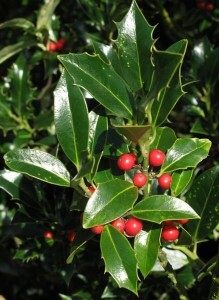 At the time of his father’s death, his eldest son, Robert, was only two years old. Robert soon grew into a temperamental young man and because of his controversial views on the monarchy he was eventually forced to leave the country. Almost ten years had passed when he returned from the Netherlands and at that time there had been a drastic reversal of his political opinions. 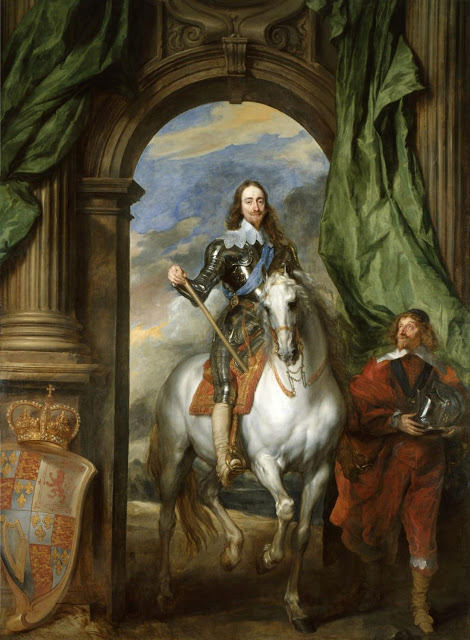 He had quickly regained favor with the King and subsequently became Lord Chamberlain of the Royal Household in April 1697. During his time as owner and custodian of Althorp, Robert had rebuilt the house and also made many improvements and changes to the grounds. 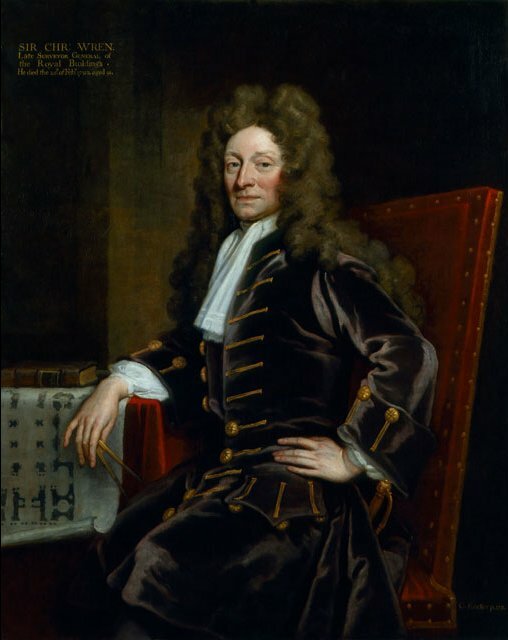 Robert died in 1702 and his son Charles inherited the estate and held Althorp for twenty years and he greatly expanded the library by adding several hundred volumes of books. 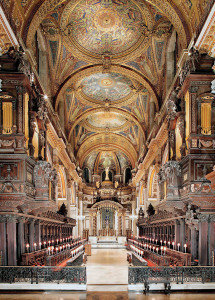 In 1700 Charles brought a higher level of notoriety to the family when he married Anne Churchill, the daughter of John Churchill the first Duke of Marlborough; the marriage brought an important connection between the Spencer and the Churchill families. 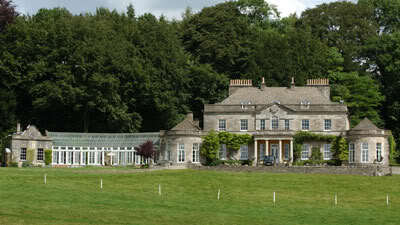 Over the next fifty years, Althorp passed through several more generations from father to son to brothers to son again. 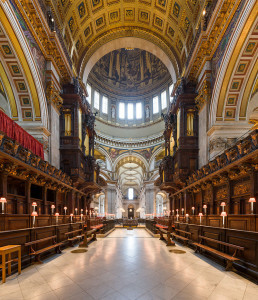 The rules of British inheritance were very strict regarding property and aristocratic titles, so for this reason the title of Duke of Marlborough came to the Spencer family through their connection with the Churchill family. 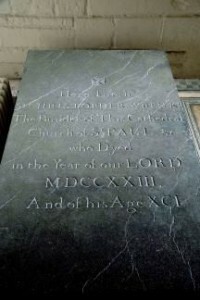 Also the monetary value of the estate had increased dramatically throughout this period, when John Spencer died in 1746 his son, also named John, received the largest inheritance in England at the time. John, the 7th Earl of Sunderland and 4th Duke of Marlborough, served as a Member of Parliament representing Warwick from 1756 to 1761. John lived a lavish lifestyle, dressing in expensive clothes and entertaining in a grand manner. When he turned 21 years old, there was a large ball for 5,000 guests held at Althorp in December 1755 and during the party John secretly married Margaret Poyntz and they waited to announce their marriage until a few days after the party. The good fortune of John continued and in 1761 King George III made him a Baron and he became Viscount Spencer, then in 1765 he became Earl Spencer. 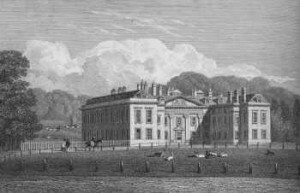 In 1783, upon the death of his father, George Spencer (2nd Earl of Spencer) inherited Althorp and he went onto have a very successful political life. He served as Whig MP for Northampton from 1780 to 1782 and then for Surrey from 1782 to 1783. 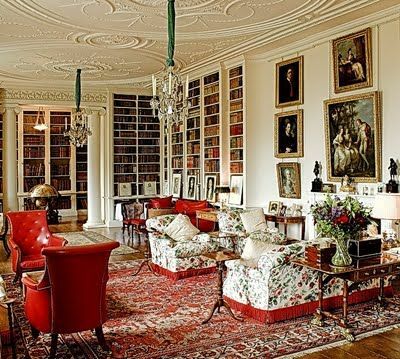 George was also very interested in Althorp’s library and, through his literary pursuits, turned it into the one of the largest private libraries in Europe. As George became an old man, his book collecting became an obsession as he attempted to collect every volume published in Britain. Unfortunately, after starting out as one of the richest men in England, by the time of his death in 1834 he was deeply in debt. John, the 3rd Earl of Spencer, was able to work through his father’s debts without losing Althorp’s large book collection. He was also to maintain the estate as well as the additional Spencer houses and properties which had become quite extensive. 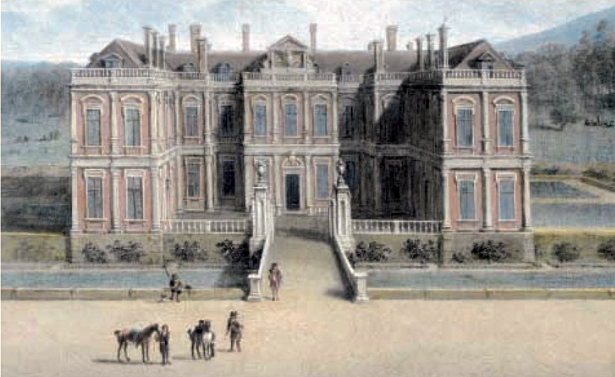 There was Spencer House in London, a home in Wimbledon, a farm in Wiseton and a hunting lodge in Norfolk. John drastically reduced his living expenses and reduced the staff of Althorp by living the majority of the year at the small house in Wiseton. The other Spencer lands and properties were leased or sold and gradually by the time of John’s death in 1845, the Spencer estate was profitable once again. 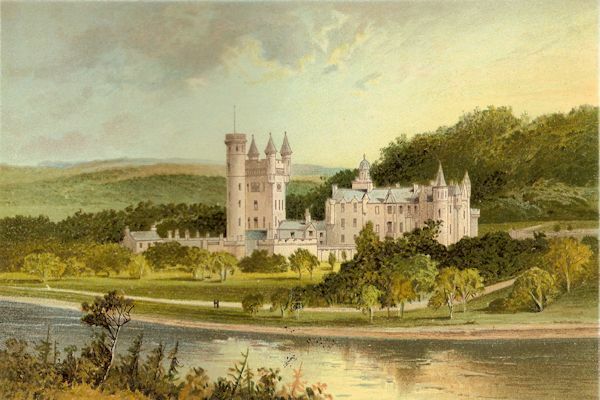 By the time of John Spencer, the 5th Earl of Spencer also known as the Red Earl, inherited the estate in 1857 it was once again in financial debt. 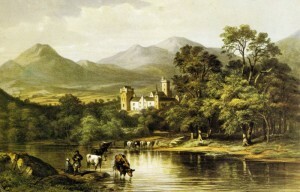 To clear the debt and maintain the estate’s many holdings, the majority of the large book collection was sold to be used in the University of Manchester. The financial problems of the Spencer family continued through the late 19th century and into the early 20th century, so many of the estate’s properties and assets were sold. By the time of Albert Spencer, the 7th Earl of Spencer, inherited in 1922 the fortune of the estate was still financially troubled and despite his heightened interest in art, he needed to sell many of Althorp’s paintings and other pieces of artwork to help decrease the debt owed. 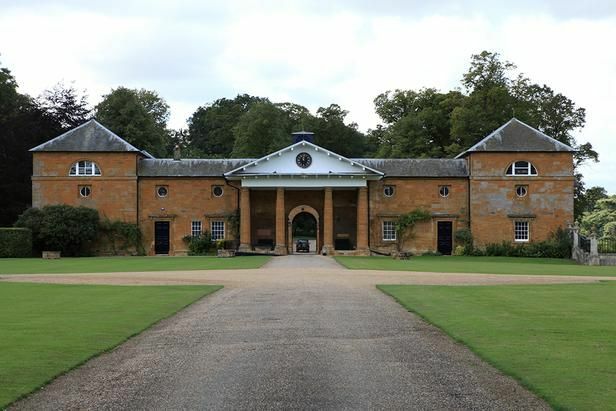 Fortunately, during World War II Althrop was not used as a military barracks or converted into a hospital for the wounded soldiers but Albert did grant them permission to use the estate’s stable instead and the main house at Althorp remained used for the duration of the war. 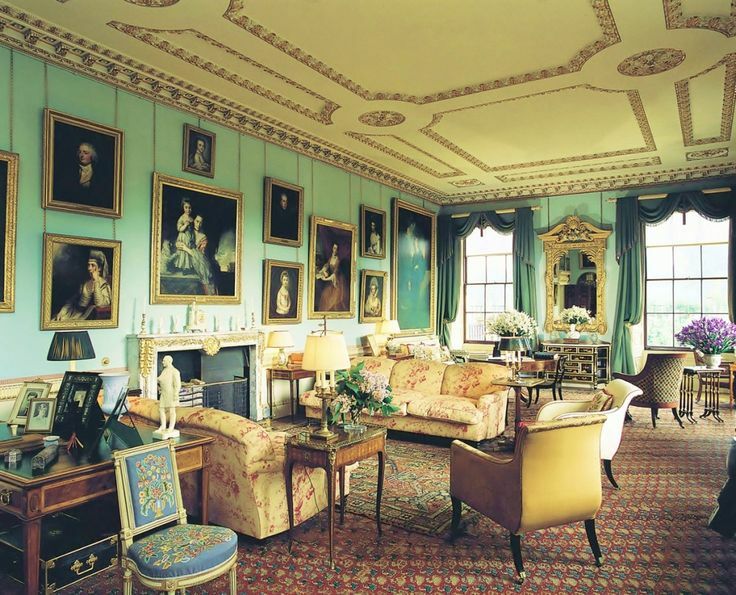 With Spencer House being located in London, during the Blitz and the frequent German bombing and the decision was made to move most of the furniture and valuable items to Althorp for safekeeping. 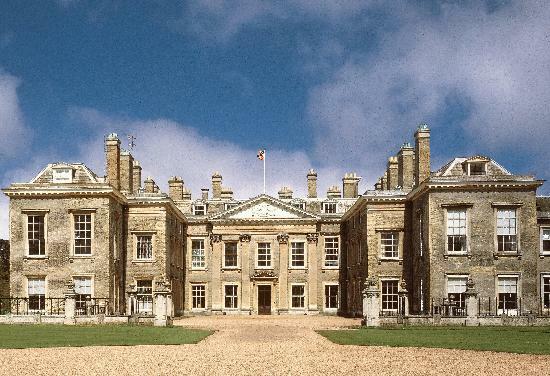 After the war, the Althorp estate was opened to the public for tours in 1953 to raise revenue for taxes. Upon the death of his father in 1975, Edward Spencer, the 8th Earl of Spencer, inherited the estate. (Edward served as Equerry to King George VI and later for Queen Elizabeth II) It was a this time that Edward and his young family of three girls and one boy came to live at Althorp, the youngest daughter was destined to marry Prince Charles the heir to the British throne in 1981 and she became Diana, the Princess of Wales. 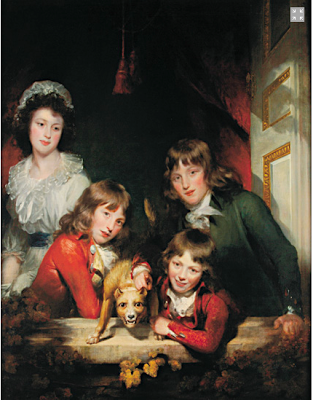 Diana and siblings enjoyed their childhood at Althorp despite the fact that their parents had gone through a bitter divorce in 1969 and their mother’s subsequent abandonment when Edward was awarded custody of the children. By the time of his death in 1992, the Althorp estate was still losing money regardless of the fact that many pieces of antique furnishings were sold. Charles Spencer, the 9th Earl of Spencer and current owner of Althorp, has been able to slowly pay off some of the debt to keep the estate running. 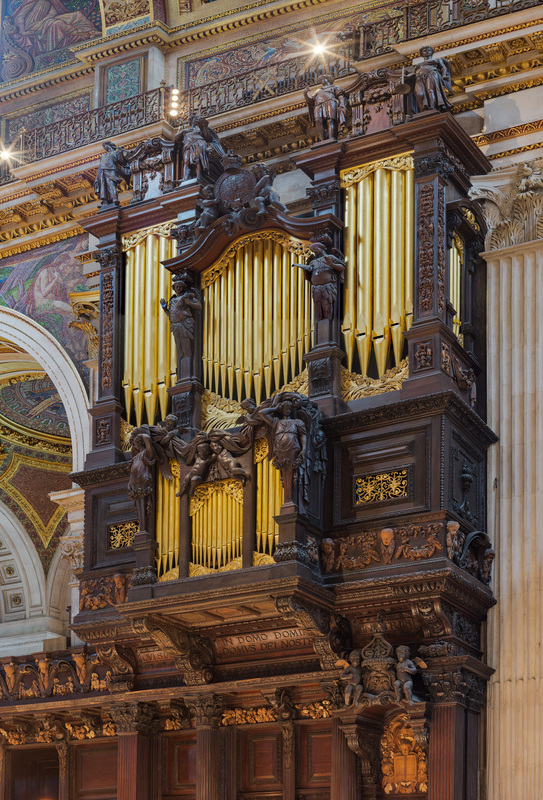 To pay for an extensive restoration project to repair the roof and stonework of Althorp, Charles auctioned hundreds of furnishings and other items which had long been in storage. After the death of his sister, Diana, in tragic car crash in Paris in 1997 and her burial on a small island on Round Oval Lake at Althorp visitors flocked to the estate to pay tribute. Despite the increased funds that this recent tourism has brought to Althorp is unsure as to whether it can be sustained over an extended period of time to provide the massive expenses needed to run the large estate. 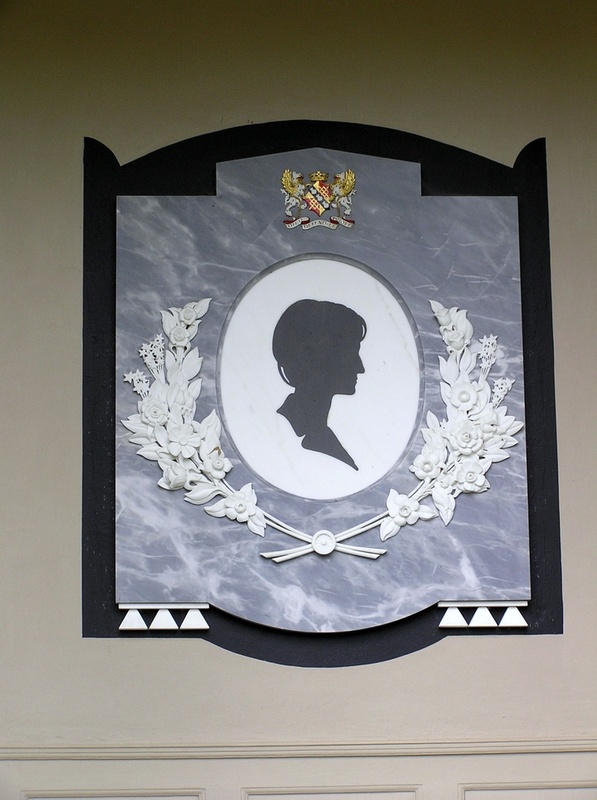 Please click on the link to Part Two for more information about Althrop including a tour of the various rooms of the house, the grounds and Diana Princess of Wales final resting place. As previously mentioned in Part One of the two part series on Althorp, I will discuss the history of the Spencer ancestral home located in Northamptonshire, England. Althorp was also the childhood home of Diana Spencer, the Princess of Wales birthday (born: July 1, 1961 died: August 31, 1997). Althorp is now currently the home of Charles Spencer the 9th Earl of Spencer; Diana’s brother who famously spoke out against the treatment of his sister at her funeral in Westminster Abbey in 1997. 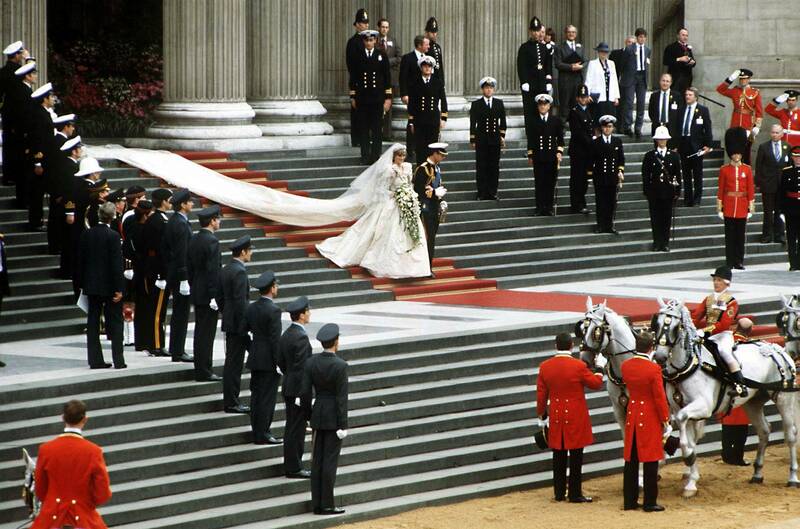 Today, Althorp is best known as the final resting place of Diana, the Princess of Wales and has become a tourist destination for many visitors to England. Althorp is located in Northamptonshire, England about 75 miles from London. 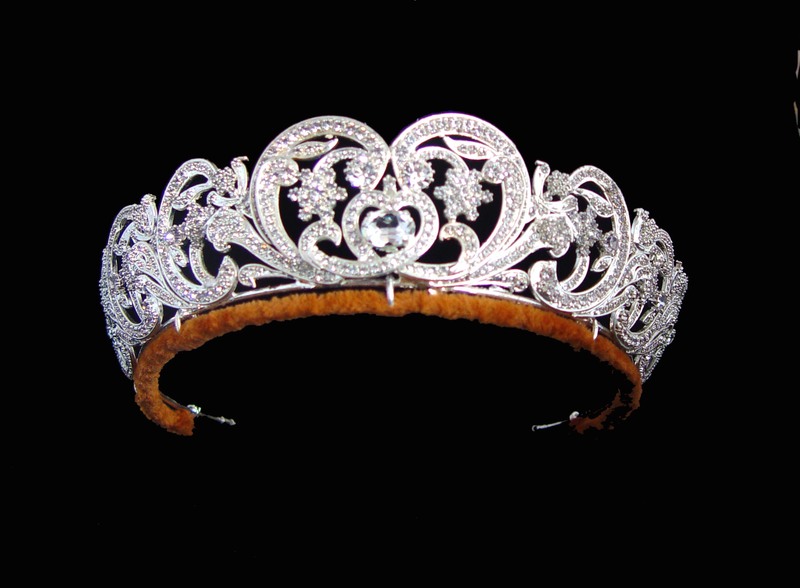 The Spencer family has lived there for more than 500 years and has paid host to various Kings and Queens throughout its long history. 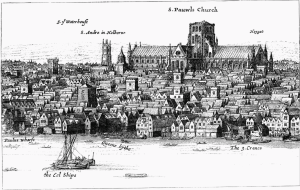 In 1603, Robert Spencer held a grand banquet for King Charles I. In 1761, King George III made John Spencer a Viscount and later the first Earl of Spencer. In 1913, King George V and Queen Mary visited the estate and stayed in the room at Althorp that is now known as the Queen Mary bedroom. 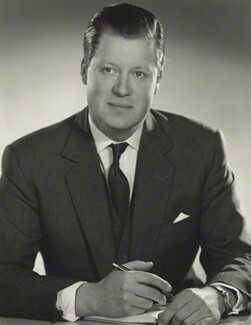 Edward Spencer, the 8th Earl of Spencer served as Equerry to King George VI and later for Queen Elizabeth II. 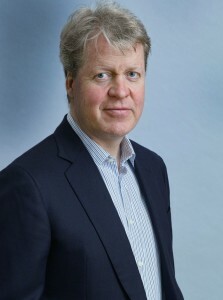 The current 9th Earl of Spencer is the brother of the late Princess Diana and is the uncle of her children, Prince William and Prince Harry. The original home built at Althorp in 1677 was a classic Tudor style red brick building. The current building dates back to 1688 with alterations made in 1788 with Yorkshire stone and four Corinthian pilasters or columns and large sash windows surrounded in stone which were added to the front exterior. 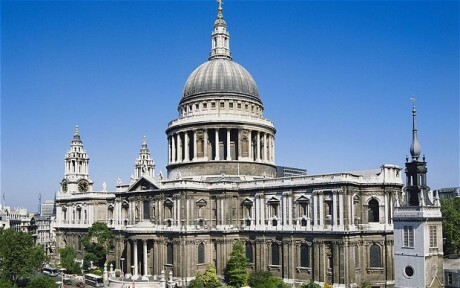 Historical Note: It has been said that the stone used for the pilasters was originally intended by Sir Christopher Wren to be used for the construction of St. Paul’s Cathedral in London. The interior of Althorp features well-appointed rooms with a central grand staircase leading to the upper floor. The rooms are beautifully decorated with furniture, paintings and objects of art including numerous pieces of priceless porcelain. 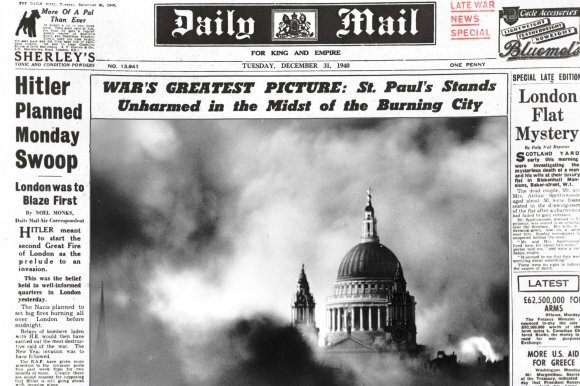 In World War II during the Blitz antique furniture, marble fireplaces and other valuable items from the Spencer House in London were moved to Althorp for safekeeping. Some interesting and unique items included doors from the Spencer House dating back to the 18th century which featured curled “S” (for Spencer) doorknobs. 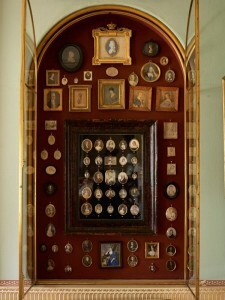 Sadly, throughout the years as the Spencer family estate became severely in debt and large portions of furnishings and part of Althorp’s large book collection were sold. Interesting Fact: Charles Spencer, the 9th Earl of Spencer and the current owner of the Althorp estate was a tour guide at the house was he was a boy. This when Charles gained his extensive knowledge about the Spencer ancestral history and most importantly how he developed his steadfast desire to maintain Althorp for future generations. 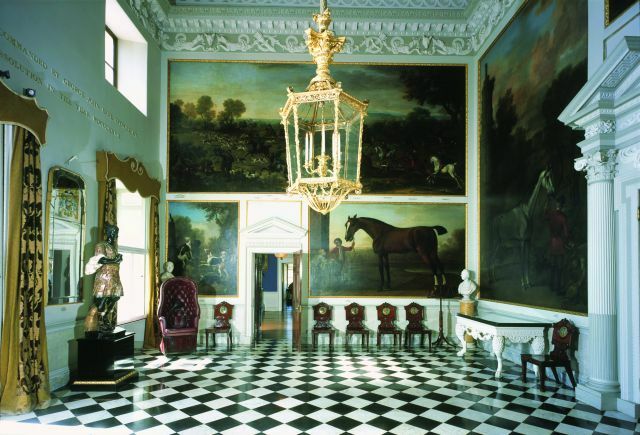 The grand entrance area located on the ground floor of Althorp is known as Wootton Hall, the name honors the English equestrian painter John Wootton. The Spencer family commissioned Wootton in 1733 to create several fox hunting paintings that still hang in the entrance hall. The space is beautifully proportioned with ceilings that rise two-stories high. 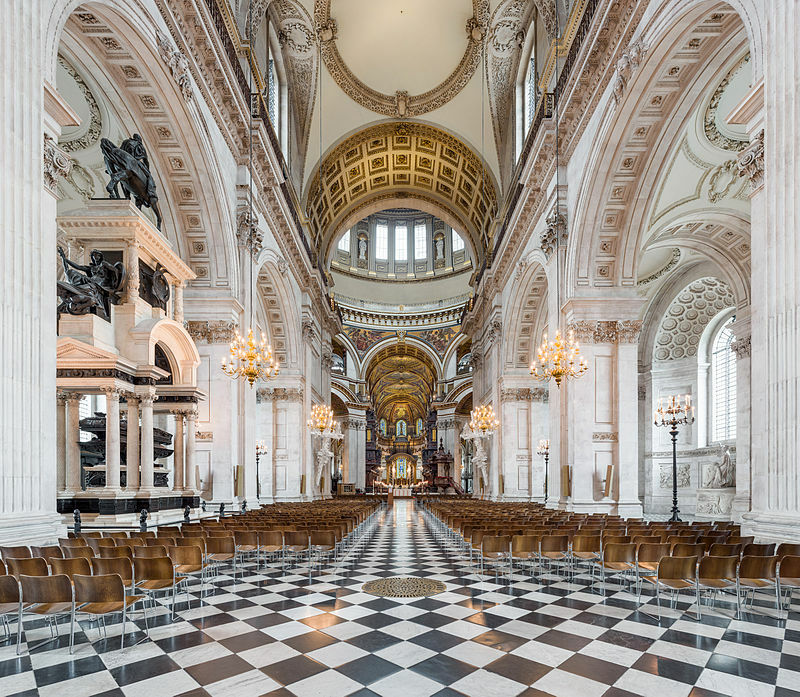 The 18th century plaster floral ceiling by Colen Campbell and the floor is made of black and white Italian marble time laid out in a checkerboard style during the 1910. 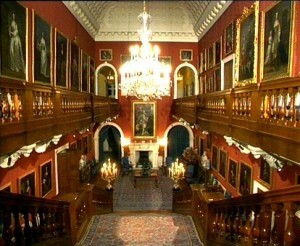 It has been said that the entrance hall of Althorp was one of the most grand of the Georgian style country homes in England. Special Note: Before leaving Wootton Hall, please notice the dozen elegant hall porter chairs lining the perimeter of the space. One of the original chairs was found discarded in the Stable Block in 1911; the chair was brought from Spencer House in London for safekeeping during the Blitz. Interesting Fact: The acoustics in the Wootton Hall are excellent and for this reason a teenage Diana Spencer (the future Princess of Wales) liked to practice tap dancing in this area of Althorp. The Saloon is located adjacent to Wootton Hall and was originally the open inner courtyard of Althorp where carriages would arrive and guests would disembark into the house. In the 1660s, a roof was put over the area and as a result of the courtyard enclosure a beautiful walnut staircase was installed. In the late 1800s, the chandeliers were wired for light and the Saloon became the first room in Althorp to have electricity. 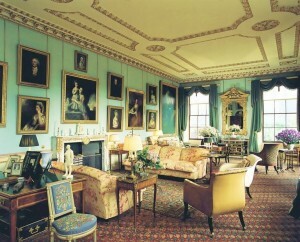 The South Drawing Room is located in the west wing of Althorp. The room retains an elegant Georgian style; the walls are a beautiful shade of blue, there are dark green window curtains, a large gilded framed mirror is positioned between the windows and the room is furnished with peach floral patterned sofas. The stone fireplace was built in 1802 and the plaster ceiling was done in 1865. 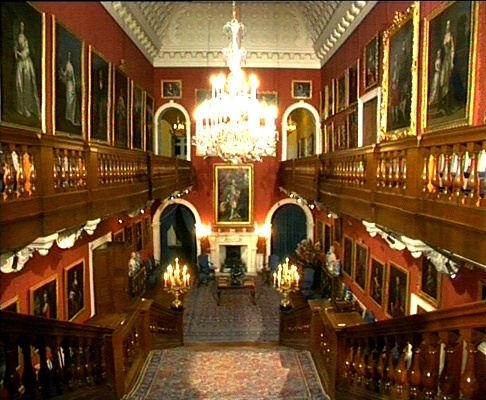 This room is also known as the Rubens Room because there are four paintings by Peter Paul Rubens hanging on the walls, there are also fifteen Joshua Reynolds portraits. Special Note: Located in one of the room’s alcoves is a collection of miniature portraits displayed in a cabinet, take a close look to find one of Admiral Lord Nelson. 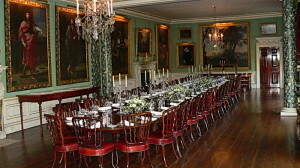 The Sutherland Room is located in the east wing of Althorp. When the house was first built centuries ago, it was once customary for the owners to occupy the ground floor to use as bedrooms and the guest bedrooms would be on the upper floor. 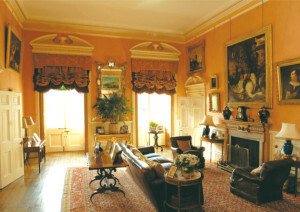 The room has the original moulding and the fireplace in the room was originally from the Spencer House in London. The current paintings in the room were chosen to honor John “Jack” Spencer, the 3rd Earl of Spencer, and reflect his passion for foxhunting. After the room ceased being used as a bedroom was used as just another reception room in the house. Interesting Fact: Traditionally, the Sutherland room has been decorated specifically for the children of Althorp on Christmas Day. There would be a fully decorated Christmas tree and mechanical Santas, snowmen and angels would be placed around the room as festive holiday decorations. As a special treat for the children, individual cakes were set out in the room with the names of the children written in icing. The Marlborough Room is located next to the Sunderland Room and adjacent to the Library. The room is named to honor Sarah Churchill, Duchess of Marlborough. Since the 1900s, the room has been used for large formal dinners, the Victorian rosewood dining table can accommodate up to 42 guests. Previously, the space had been divided into two different rooms, one was used as a reception room and the other was the old billiard room. In the 1950s as part of a restoration project at Althrop, two chimney pieces from Spencer House were installed in the room. 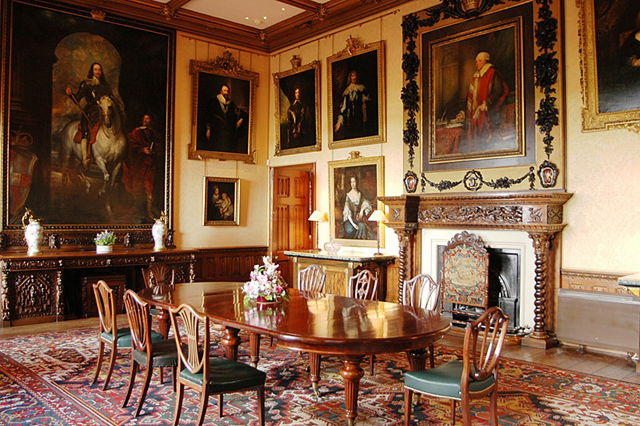 Special Note: The portraits of various Spencer ancestors painted by famed artist such as Thomas Gainsborough, Joshua Reynolds and George Romney are hung in the Marlborough Room. 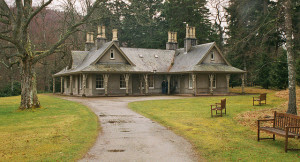 The Great Dining Room was part of the east wing extension which was built back in 1877. 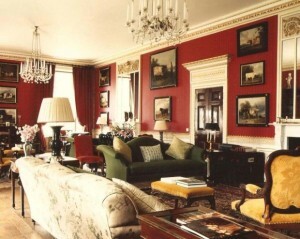 The relatively small room is said to have gotten inspiration for the red damask silk wall coverings from the much larger and grander ballroom of Buckingham Palace. 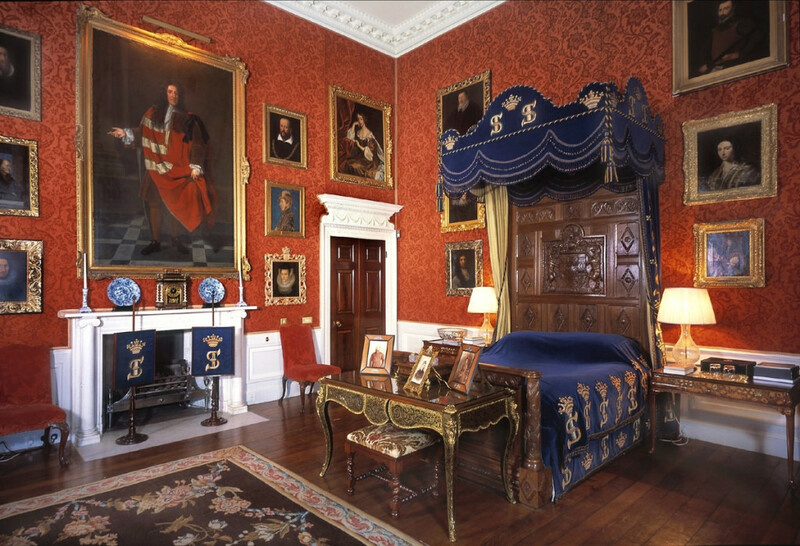 The two large tapestries cover the oak paneling that was originally from another property of the Spencers owned and it was brought to Althorp specifically for installation in this room. 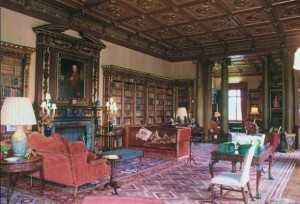 The Library is located on the first floor in the west wing of Althorp, it is sometimes referred to as the “Long Library”. 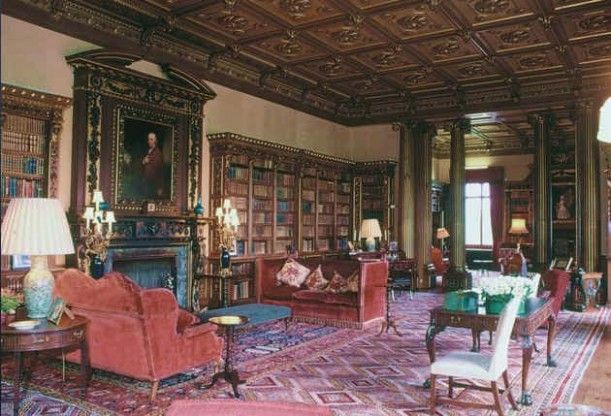 When George Spencer (2nd Earl of Spencer) inherited the estate, he was very interested in his literary pursuits and his book collection turned the Althorp library into the one of the largest private libraries in Europe. As George became an old man, his book collecting became an obsession as he attempted to collect every volume published in Britain. Five rooms at Althorp were needed to store the large collection and eventually the rooms were combined into one long 200 feet by 20 feet room, hence the name of “Long Library”. The ceiling of the original library collapsed in 1773, it was replaced and a new floor was also installed. 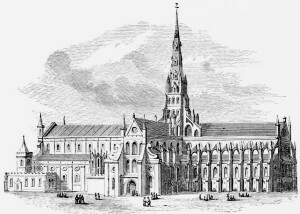 Unfortunately, by the time of George’s death in 1834 he was deeply in debt and a major portion of the collection was sold to the University of Manchester. The books seen in the library today on a tour of Althorp were fairly recent acquisitions and the dark and rich colored spines of the books are beautifully displayed against the off-white painted shelving. 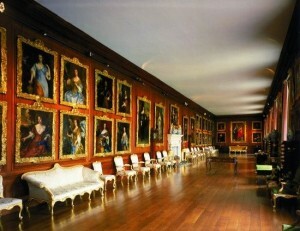 The Picture Gallery is located on the first floor of the west wing at Althorp. The Picture Gallery is most famous for the collection of 60 portraits, 10 of those portraits are Sir Peter Lely paintings of King Charles II ten mistresses that have become known as “The Windsor Beauties”. The 115 feet by 21 feet room is decorated with lovely oak paneling and oak flooring which at one time was painted white, fortunately the paint was removed during a restoration project in 1904. 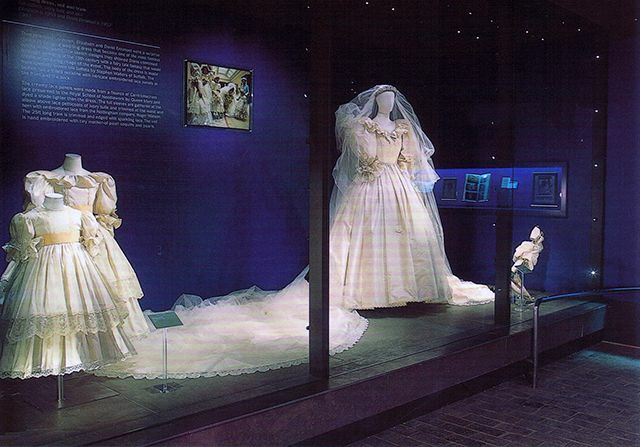 Interesting Fact: In Tudor times, the room’s dimensions were put good use when during inclement weather the ladies would use the Gallery to promenade (walking as a form of exercise and socialization) indoors to avoid soiling their dresses in the rain and mud. 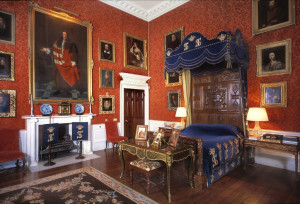 The Oak Bedroom is located on the first floor to the rear of the west wing at Althorp. The room is beautifully decorated with crimson wallpaper, a polished oak floor and repeated in the room several times is the Spencer “S” most notably on the blue velvet bed cover, above the large bed and near the fireplace. 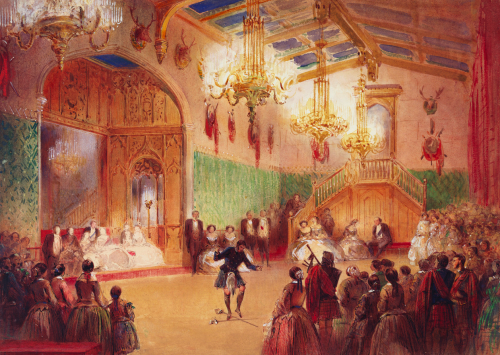 Interesting Fact: The room was the site of an important event in the history of the Spencer family. On the night of December 20, 1755, during a ball being held in celebration of John Spencer’s 21st birthday, the first Earl of Spencer secretly married Margaret Georgiana in the Oak Bedroom. The Princess of Wales Bedroom, as most people would assume, was not named for Diana but another beloved Princess of Wales. 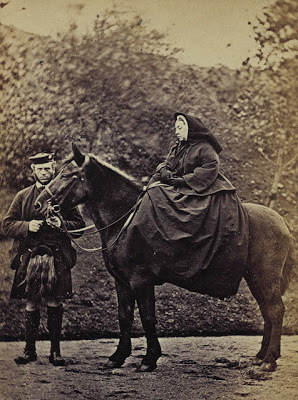 It was Princess Alexandra, the wife of the future King Edward VII who came to visit the 5th Earl of Spencer (the Red Earl) at Althorp in 1863. The room was renovated in 1911 ad retains a distinct Georgian style of decoration. 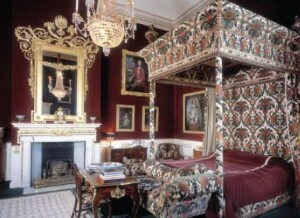 The large and luxurious bed is draped in fabric originally designed during the renovation. Two portraits of note in the room are the painting by Spanish artist Murillo of a young princess and the other is a painting by the School of Leonardo da Vinci of a young lady that bears a striking resemblance to the Mona Lisa. 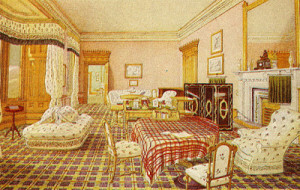 The Queen Mary Bedroom is named for Queen Mary, the wife of King George V who visited Althorp in 1913. The centerpiece of the room is the tall bed which is draped in green taffeta and designed in an 18th century style. An item of note in the room are two antique chairs with needlework design and personally created by Albert Spencer, the 7th Earl of Spencer who was the Chairman of the Royal School of Needlework. Interesting Fact: As a side note regarding Queen Mary, she was a horrible houseguest in regards to the fact that when she would visit the stately homes around England she was always on the search for interesting and sometimes valuable items. She would strongly hint at her desire for a particular item belonging to her hosts, ultimately they would feel obligated to give her the item as a gift. In this way Queen Mary acquired many excellent pieces of furnishing and art objects at no cost which she used to decorate her own home. The Althorp estate covers over 13,000 acres of land in Northampshire. Besides the main house there are 28 other buildings and structures located on the property. The estate is beautifully landscaped first by Henry Holland in the 1780s and then by William Teulon in the late 1800s. 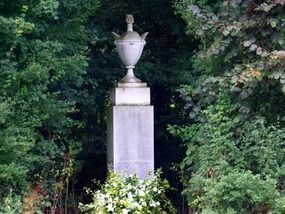 After Diana’s death in 1997, when the Memorial was moved to its current site, Dan Pearson was commissioned to upgrade the park and gardens to accommodate the increased number of visitors that would be coming to Althorp. Pearson planted 36 oak trees along the access road to commemorate Diana’s age at the time of her death. Over one hundred white water lilies were added to waters of the Round and one hundred white roses were planted on the island which is Diana’s final resting place. Special Note: After Diana’s separation and subsequent divorce from Prince Charles, the Prince of Wales, was finalized in 1996 she had considered moving to a small cottage known as the Gardener’s House, on the Althorp estate. 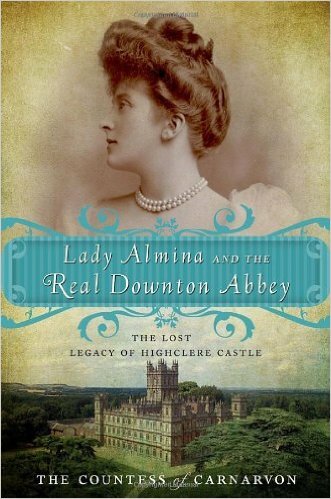 It seems that the request was denied by her brother, Charles Spencer, who is the current owner of Althorp. He claimed that the Diana’s move to Althorp would cause innumerable security problems. 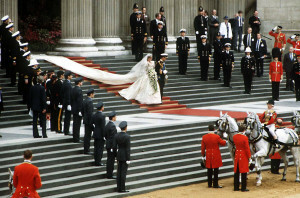 This decision had created a friction between Diana and her brother and their relationship was strained and intermittent at the time of Diana’s death. Interesting Fact: The story of the famed Spencer Sweet Pea began back in 1901 when the 5th Earl of Spencer’s chief gardener, Silas Cole, cultivated a variety of sweet pea that produced large pink flowers with wavy edged petals which he named the “Countess Spencer”. This variety of sweet pea has been growing on the Althrop estate now for almost 115 years. 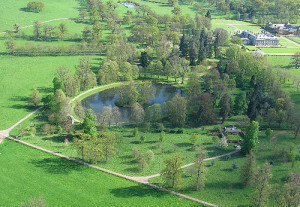 The lake located on the Althorp estate, known as the Round Oval, was constructed in 1868. 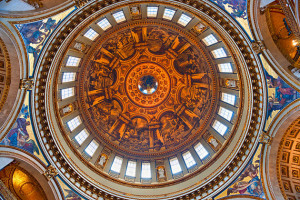 The Doric-style Temple located south of the Round Oval was original located in the gardens of Admiralty House in London. 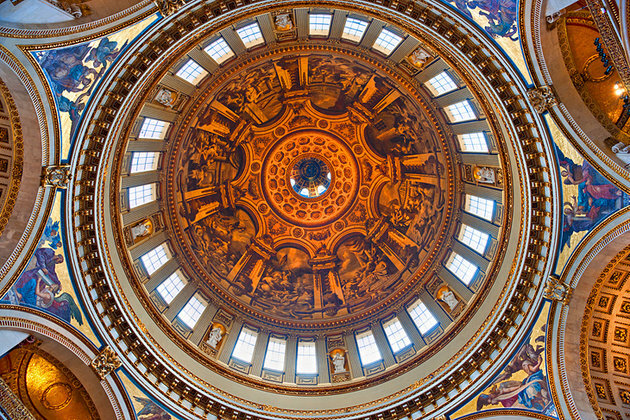 It was commissioned by George Spencer, the 2nd Earl of Spencer, to celebrate the British naval victory led by Rear-Admiral Horatio Nelson over General Napoleon Bonaparte French forces in the Battle of the Nile in 1798. 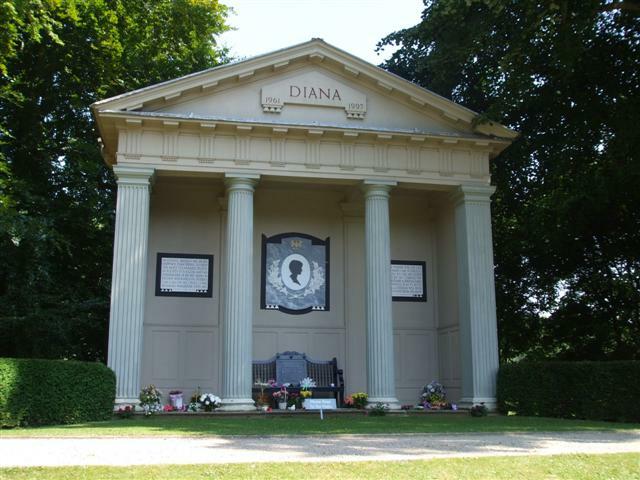 The Temple was moved to Althorp in 1926 and after the death of Princess Diana it was rededicated to her memory. The Temple now bears the name of Diana which is inscribed at the top and it contains a large black marble silhouette of the Princess set on white marble and placed in the middle of the Temple. The large medallion is flanked by two large stone tablets, one inscribed with a quote from Diana regarding her charity work and the other is inscribed with Charles Spencer’s speech given at his sister’s funeral in 1997. 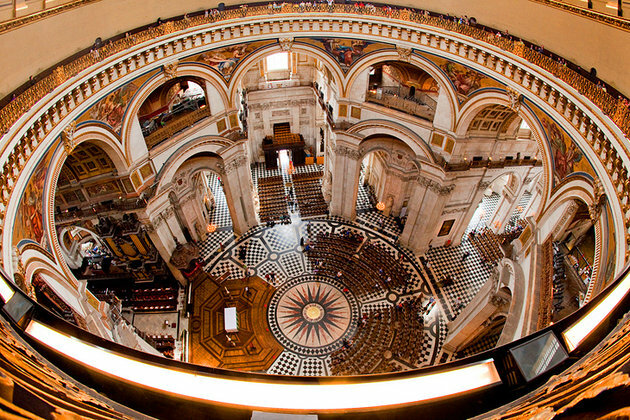 The small island located in the middle of the Round Oval is the final resting place of Diana, the Princess of Wales. 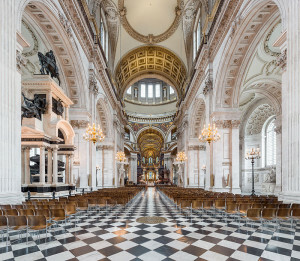 After the overwhelming grief of the public over her tragic death and taking into account the endless media pursuit in her public life and lack of privacy regarding her personal life, Charles Spencer decided that the best place for her gravesite. The choice of her burial on the island not only provided privacy that had been denied to Diana during her lifetime from the intrusive media coverage but it also gave dignity to her final resting place with some distance from well-meaning but sometimes obsessive public and the island is deemed off limits to anyone without the permission of Charles Spencer. 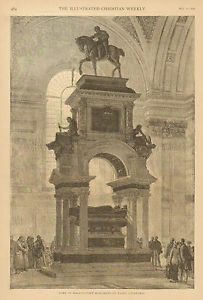 Her burial place is marked by a simple white memorial column with a stone urn on top; there is no headstone at the gravesite. 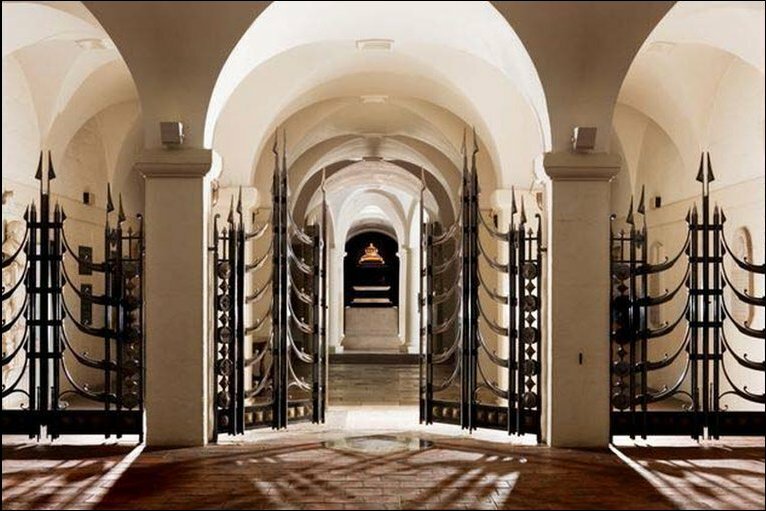 The Stable Block was originally designed by architect Roger Morris in the early 1730s commissioned by Charles, the 5th Earl of Sutherland. The building’s Palladian style of architecture was said to have been inspired by Morris’ own horse stable in Convent Garden. The decorative fountain in the courtyard was installed to provide water for the horse troughs. The interior included several stalls for the estates’ numerous horses, a bath area for the riders to use after hunting, a veterinarian’s room and storage area. After the death of Diana, the Stable Block was converted into an exhibition hall dedicated to the memory of the Princess of Wales. Six separate exhibit areas were created within the old stable complex. 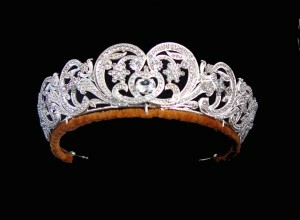 The first exhibit was the “Spencer Women” which highlighted the ancestral heritage of the women of Althorp with several displays showcasing jewelry, personal items and two large portraits, one painting of Sarah, Duchess of Marlbourough, and the other of Georgiana Spencer. The second exhibit area plays a video of Diana ad a child, including rare footage of her christening and first birthday as well as additional footage showing her swimming, dancing and playing with her animals. Displayed around the room are her old toys, ballet shoes and other childhood items. 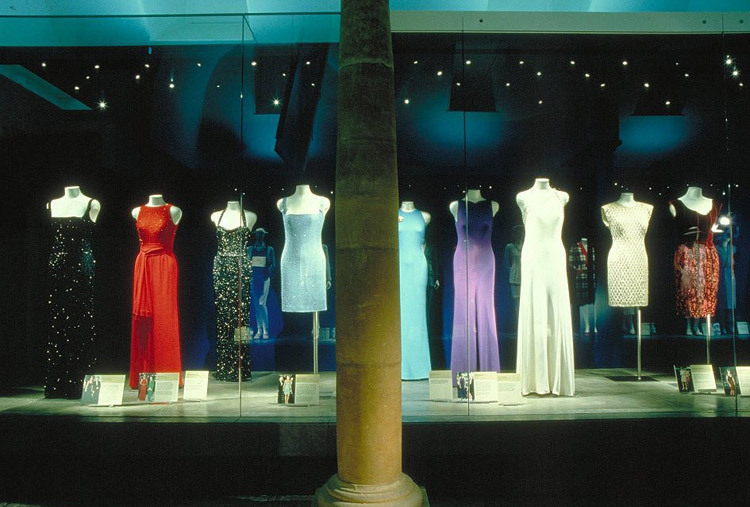 The fourth exhibit documents Diana’s extensive charity and humanitarian work. The next exhibit, which is known as the “Tribute Room”, documents the days between Diana’s death, funeral and burial at Althorp. The final area was the “Diana: A Celebration” exhibit with large glass display cases showing many of Diana’s most notable dresses and gowns with information cards indicating the when and where she wore the clothing items. One unique display is filled with the condolence books that were signed by hundreds of thousands of people who express their feelings about Diana and offer their sympathy to the Spencer family. 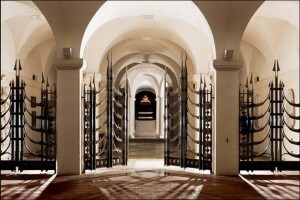 The Althorp house and estate is opened to the public annually during the months of July and August but in 2013 the Stable Block and exhibitions closed permanently. 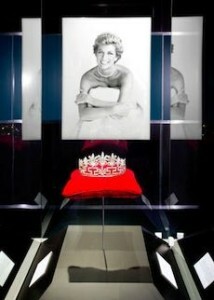 The Princess of Wales Memorial Fund which received the profits from the exhibition had previously closed in 2012. At that time, Althorp needed to address the concern about the exploitation of Diana and more importantly there was a need to suppress the public’s obsession with Diana. 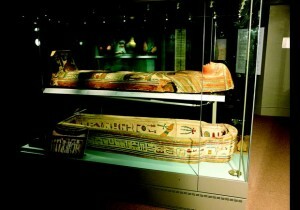 It is said that the personal belongings that were part of the exhibition would be packed and eventually returned to her sons, Prince William and Prince Harry.